Many people wait for the first signs of the Spring Season and the longer days that follow, warmer weather and spring flowers that begin to peek their heads out of the ground attracting wildlife and encouraging us to all get outdoors for fun and exercise. Why wait for the full summer blooms when you can add colorful garden ideas by adding some fast growing perennial spring flowers this year that will give you years of colorful pleasure both indoors and outdoors. Adding Spring Flowers to your yard or garden will also help to attract the wild birds, bees, bugs and butterflies as both a source of food and shelter and are great additions to flower gardens just outside of windows as well as just off patios or decks enhancing your total outdoor experience. Crocus – this perennial flower is one of the first signs of spring and are oftentimes seen popping up between areas of melting snow. The crocus plant is available in a variety of colors, mainly white, purple, yellow and blue flowers each with six petals. They bloom in a cone or cluster shape and are fairly low laying plants and mainly prefer sunny locations although some varieties do grow well in partly shady areas of the yard or garden. Plant beautiful crocus seeds - they're deer resistant too! Daffodil – another early spring arrival is the daffodil (Narcissus) which is available in various shades of yellow and golden or white colors. One stem produces several flowers each with six petals and many daffodils have a different colored center making them very attractive to gardeners. Daffodils are often grown in large clusters along a side of the home or mixed with wild flower gardens. They need full sun to part shade and well nourished moist soil. Blooming daffodil plants can be transplanted during the spring otherwise, bulbs are planted in the autumn months for spring blooms. The daffodil is the symbol of unrequited love as well as the American Cancer Society’s fundraiser symbol each year to raise awareness of cancer. *The daffodil contains a dangerous toxin that can cause illness and even death, so should be avoided in areas where pets or children are likely to eat the bulbs or leaves. Lilacs – plant lilacs in the spring for their amazing scent that fills the air as you walk by them as well as the beautiful purple flower clusters that are just plain wonderful to look at. There are many shades of purple flowers or white lilacs to choose from and they need full sun to part shade in well drained soil to be healthy plants. Choose a lilac bush to showcase your home’s entry path and cut the stems to fill bouquets indoors to scent an entire room. * In our yard, we had a lilac bush that wasn't doing very well so we re-dug a larger hole, added fertilizer and it perked up right away and got more blooms each year after. If you have any problems with your own lilacs, consider replanting it and giving it more nutrition. Hyacinths – another early bloomer to plant in your garden is this perennial that has a very fragrant interesting scent and is available in a wide variety of colors such as yellow, blue, orange, white and pink flowers. Although many of these are grown from bulbs in the fall, they can also be purchased as blooming plants that can be transplanted into the garden or landscape for an immediately colorful garden this year. The most economical way is to plant the Hyacinth seeds. Hyacinths prefer well drained sandy soil and full sun for the most blooms and a trellis or wall to climb on. Tulips – one of the easiest to grow flowers and first signs of spring. Tulips are available in almost every color imaginable from red, plum, orange, coral, yellow, white, purple or pink flowers. Each stem produces one flower and tulips need well drained, nutrient rich sandy soil. Tulips not only look lovely in the garden but also make beautiful bouquets alone or mixed with other flowers. Lily of the Valley – is a sweet and delicate looking flower that is one of the first spring flowers to pop up. 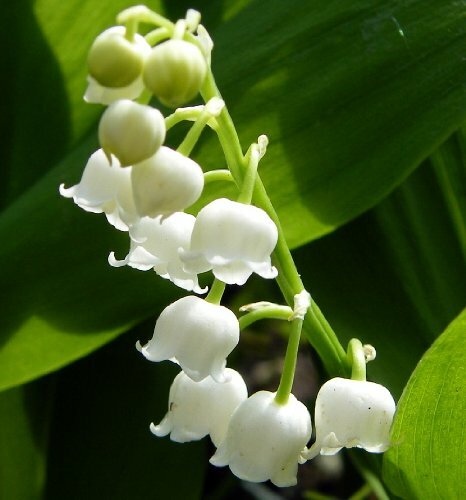 Lily of the Valley has a very small, white bell shaped flower that hangs against the bright green leaves, prefers full sun and well drained soil. They look great in small flower gardens or along borders in a garden. Lily of the Valley is often used as wedding flowers ideas as fillers or a main flower selection and is lightly scented. Scroll down for my favorite! Calla Lily – a most popular spring flower that is the choice of spring brides as wedding flowers for bouquets for their simplicity, elegance and creamy color. Calla lilies prefer nutrient rich, moist soil in full sun for the best blooms and are fairly easy to grow with minimal effort on the gardener’s part. Dahlia – is a spring flower to add to your garden because they have a large flower head, looks a little like a pom pom, is often doubled and are available in a wide variety of colors such as red, white, orange, plum, purple, cranberry, yellow and pink flowers. Dahlias will grow at least 12” up to 60” in many cases. They like full sunlight, well drained soil and make a nice addition to floral arrangements alone or mixed with other spring flowers. These are some of the most popular and easiest to grow spring flowers for a colorful garden that are also perennials that will come up year after year with proper care. If I can grow these, so can you! Many of these spring flowers can be purchased in kits including everything you need to get started with your gardening project indoors or outdoors. Spring Flower Plants can also make a lovely gift for any spring event you may need for someone such as a birthday, graduation, wedding, shower and don't forget Mother's Day. Shop online for free shipping and free gifts with purchase at amazon.com and many other locations for the best spring flower plants and bulbs. Choose your favorite colors that will enhance the exterior of your home as well as bring fragrance indoors. You don’t need to be a licensed gardener to plant spring flowers that will help you get outdoors and enjoy more of what nature has to offer. White Lily of the Valley 10 Pips - Great for Shade! One of my favorite flowers and a winner in bridal bouquets, for proms and in floral arrangements too. It's white, delicate and shaped like teenie upside down bells and super easy to grow - loves the shade.